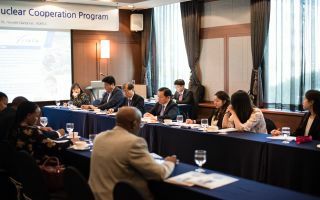 Since established in April 2011, KNA endeavored after enhancing high-level international cooperation and partnership, especially by sending Korean experts to the universities in newcomer countries willing to deploy nuclear power and by inviting local experts to Korea. After signing a MOU between Alexandria University, KNA, KEPCO, and KINGS on October 2015, KNA continued human resource exchanges with Alexandria University, which is the only university that opened nuclear engineering department in Egypt. 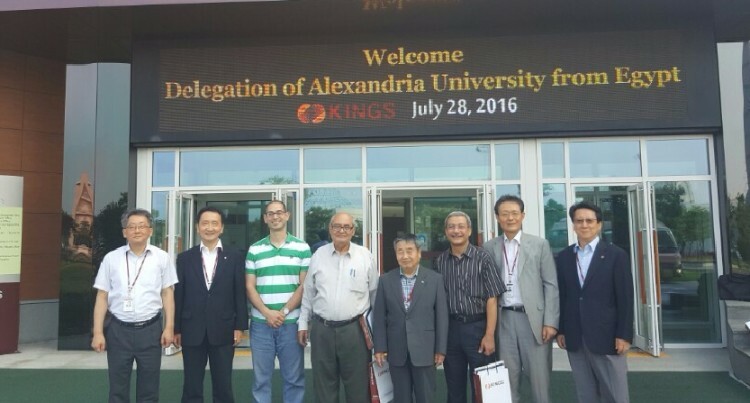 Under the cooperation with KINGS and other nuclear industry organizations in Korea, KNA invited professors from Alexandria University from 24 to 30 July and dispatched Korean Experts from 21 August to 2 September 2016. KNA supported professors of Alexandria University in visiting Seoul National University, Korea Atomic Energy Research Institute(KAERI), Doosan Heavy Industries, KHNP, KINGS, and UNIST. During the visit to Seoul National University, professors actively expressed interest on the curriculum and hope to conduct the collaborative study. At KAERI, KAERI gave briefings on radioisotopic research and research reactors. Rest of visits also let professors eager to promote bilateral nuclear human resource management. Second, KNA dispatched Korean experts to lecture for students of nuclear engineering department of Alexandria University. Lecture about “Nuclear Power Plant Systems” was given at Alexandria University for 2 weeks. Last, since signing the MOU with Chulalongkorn University in Thailand in December 2015, KNA dispatched 2ndKorean experts from August 15 to 26 to lecture about “Preparation of Infrastructure needed for Implementing NPP”. Taking all these efforts into account, KNA’s cooperative program in the field of nuclear human resource management is expected to strengthen the bilateral relationship with Egypt and Thailand. Also, through this program, KNA would support all newcomer countries in exchanging technology, building up nuclear human networks, and construction of nuclear infrastructure. 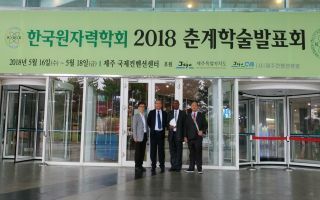 During “Korean Nuclear Society’s Spring Conference,” which was held from 16th to 18th of May in Jeju International Convention Center, the Korea Nuclear Association invited professors from National University of Malaysia, University of Technology, Malaysia and..
As part of continuing effort to strengthen cooperation between Korea and newcomer countries, KNA invited opinion leaders of Sri Lanka Atomic Energy Board(SLAEB) from May 20th to 26th. The delegation headed by the chairman of SLAEB, Lakshita Jay..
KNA strives to expand cooperation with countries that are willing to introduce nuclear power. 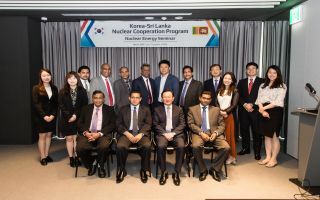 As part of such efforts, KNA often hosts cooperation program that consists of nuclear seminar and visits to major nuclear facilities in Korea. Under the program, .. 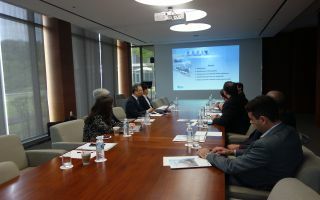 The Korea Nuclear Association invited officials from Brazil’s nuclear industry, in order for them to gain a better understanding of Korea’s nuclear industry as well as finding areas of future cooperation. 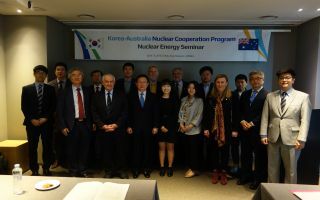 Members of the delegation included officials from the Ministry of Min..
KNA invited opinion leaders from Australiato help them understand the competence of Korea’s nuclear industry from April 16thto 20th. During the seminar, the opinion leaders presented energy status quo inAustralia as well as the necessity to implement nuclear power plants. .. COPYRIGHT © 2017 KOREA NUCLEAR ASSOCIATION FOR INTERNATIONAL COOPERATION. sinbiweb all right reserved.